As one of the premier superstars in men’s NCAA basketball this year, Ben Simmons has led his LSU Tigers to a modest 9-6 record, but has done so with a variety of Nike-branded heat. 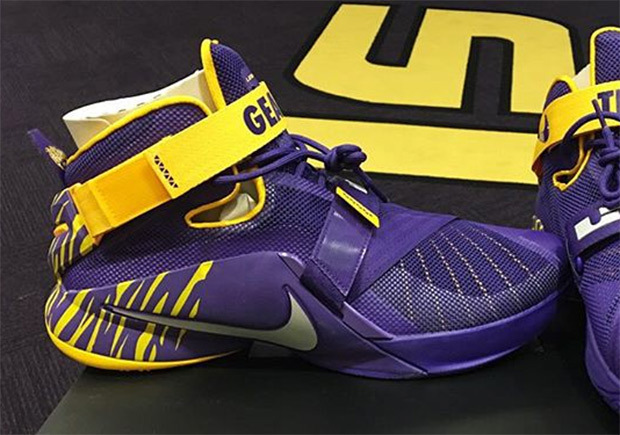 We first previewed his crazy lineup of LeBron 13s featuring LSU’s iconic gold and purple colors, and now the star forward breaks out another pair that features King James’ name, the LeBron Soldier 9. This particular model has already been seen as an Oregon Ducks and Ohio State Buckeyes PE, but things get even more exciting on this LSU-themed pair, which includes tiger stripes on the heel and the school’s “Geaux Tigers” battle cry on the ankle strap. While this is sure to remain a player exclusive to the school, it’s always a treat to see what these talented athletes have stored in their locker, and also what may be a future relationship between Nike and Simmons. Get a closer look at the sneaker below and stay tuned for more player exclusives in the future.